Safety is everything when climbing and investing in the best bouldering crash pad is as crucial as your climbing helmet and climbing shoes to ensure you get up and back down the rock in one piece. While you’re probably not ready to attempt the same feats as seen in the anxiety-inducing, sweaty palm-causing, acrophobia-awakening Free Solo, that’s not to say you can’t get in on the action. 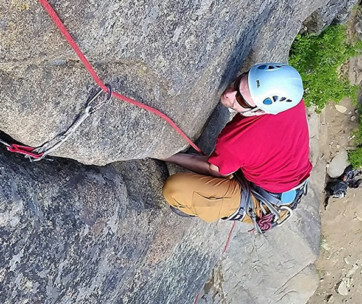 Finding the right crash pad for you is a great way for both beginner and experienced to stay safe especially if you want to check out the best climbing spots in the USA. they’re also great for increasing your confidence, allowing you to climb and conquer crags you never thought you would, and as for a total free climb ascent, maybe next year, yeah? Our top pick for the best bouldering crash pad is the Black Diamond Mondo Bouldering Pad. The large surface area ensures safety, measuring 32” wide, while the 10” height ensures adequate cushioning from a variety of heights, whether you choose to fall or not. This cushioning is enhanced with a revolutionized closed-cell foam layup on the side you’ll fall onto, while the high compression lower foam on the surface level helps to spread the impact and minimize injuries. It’s so effective, you’ll feel like a cartoon character falling conveniently onto a cloud because if that happened in the real world, you’d just get wet. It folds up neatly to minimize space when stored and in the car on the way to your climb, for simple and straightforward transportation. A massively popular option, it’s the best crash pad you’re likely to find for both beginners and experts top keep you safe and comfortable upon landing, maybe so much so you’ll never want to get back up. Nevertheless, make sure you always have your climbing helmet on. The second bouldering pad in our selection is the Mad Rock R3 Crash Pad, and this mat is excellent for pushing those teetering on the edge between beginner to intermediate to take that leap. It boasts a new fill system that allows the pad to lay as flat as possible on all kinds of terrain, and by doing so, it dampens the fall like few other options around, particularly at this price. The nylon cover is also the most durable available. While other covers are around 1000D, this 1680 denier construction means it’s built to last and can handle dragging, pushing, and even throwing across jagged terrains and surfaces and coming out the other side unscathed. The dual gear loops help with hands-free carrying to prevent over-encumbering yourself, and the shoulder and waist support straps help prevent fatigue when carrying it long distances, which is necessary because of the weight. While it’s not the heaviest pad we’ve selected, it still might be a challenge for smaller solo climbers to carry by themselves. The Mad Rock Mad Pad is another decent and slightly cheaper pick for relatively experienced boulderers and those who are lucky enough to have their own home-bouldering wall. With it, you’ll get a reliable combination of close and open cell foam to ensure the best of both worlds, which softens impact and delivers firm but comfortable drops without risk of injury. The backpack straps make it easy to carry, and the hip belt offers greater support to help maintain your posture when on the move. 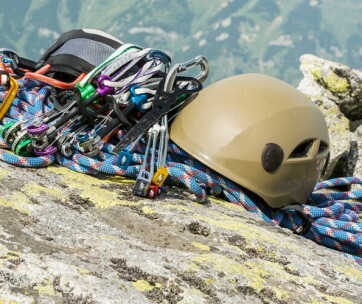 Unfortunately, there are no gear straps or pockets to keep your items safe when climbing, but if you’re someone who travels light, this won’t be an issue. Most useful, though, is the ability to connect it with additional Mad Pads to maximize drop zone space. This is especially useful when climbing in a large group and also gives novice climbers more confidence the landing site protects them. Once you’re done for the day, you can also convert it into a lounge chair for some much-deserved relaxation. 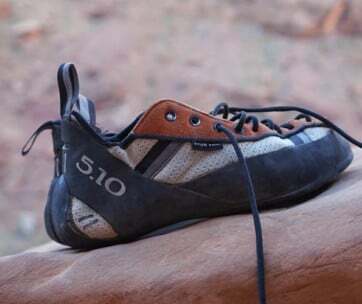 If you like climbing, check out our selection of the best rock climbing shoes. With a trifold design, the Metolius Recon Crash Pad doesn’t just ensure longevity, but also easier storage in the back of your car, and the sides clip together to keep it secure when in transit. It also boasts a greater surface area than standard climbing pads, providing 5.5 square feet, which is ample space to drop and roll without risking injury. The 900 denier fabric is tough, but not the toughest around, which doesn’t seem quite right when you consider the price. What the cover lacks in basic durability, though, it makes up for with protection, and the ballistics on the bottom enhance and increase its lifespan where other 900D fabrics would fail. It’s also easy to carry, however, it’s still the heaviest pad we’ve selected and this could be an issue for solo climbers, and even if you’re climbing with a buddy, it could still cause unwanted fatigue before you even make it to the crag. Despite this, it’s still a high-quality option for experienced climbers and anyone who wants to skip replacing their original mat after only a year. If you’re looking for somewhere to spend all the money you’ve got set aside for climbing gear, the Petzl Alto Crash Pad is a superb choice. It’s super-protective, boasting 3 layers of foam of varying densities to soften your fall like nothing else around and allowing you to drop from whatever distance you feel like with confidence. It’s easy to transport, despite its weight, and the wide shoulder straps ensure comfort when carrying it between crags and boulders. The zippered flap is also useful for keeping valuables secure while you’re up high, and the vibrant orange color means you’ve got an easy-to-aim-for-target. Although it’s slightly smaller than some options we’ve selected, this high-quality bouldering crash pad still delivers unmatched performance for solo or duo climbers, and while you’re spending a little more than you would on others, its patented folding system ensures the foam lasts longer and keeps you safe every time, too. You may also like to check our guide to the best climbing ropes for more great equipment. On the other end of the price spectrum, the Metolius Session II Crash Pad is a great value option perfect for beginners or those who don’t have too extreme bouldering options close by. Evolving from the Session I, this crash mat comes with a redesigned flap making the pad easier to load into cars while also simplifying transportation with comfortable padded shoulder straps. Once it’s on the floor, it’s also easy to move around, and the new drag handles are robust with enough weight behind them to move the pad with little effort. The lightweight design also contributes to this, and eases the pressure on your arms and hands, saving them for the actual climbing. The size means it’s not ideal for higher falls, but considering this is more likely to find its way into the lives of beginners, this won’t be a problem. With a tough, durable exterior fabric and quality construction, it’s a superb entry-level crash mat you can feel safe falling onto any time. Another highly sought-after option is the Black Diamond Drop Zone Crash Pad which is a little more compact than other options but is still useful for smaller climbs and beginners who don’t want to get too high too soon. The 1000 denier nylon and PU coating on the sleeve are durable, capable of withstanding dragging, pulling, pushing, and throwing the mat over a variety of terrains and uneven surfaces, while the closed-cell PE to and PU foam base gives you a safe landing. However, this padding isn’t as thick as others around and is only 3.5”, so it isn’t advised to use it for high climbs and falls. The taco-style fold makes it easy to pack away when you’re not using it, and it’s lightweight enough for simple carrying either solo or with two people. To ensure valuable and gear security, there’s also a large stowable area to keep everything in one place and prevent things falling out or being stolen when you’re too high to do anything about it. This also makes a perfect gift for rock climbers. Our final pick is the Asana Sidekick Bouldering Pad, which is less of a full-blown bouldering mat and more of an add-on bouldering mat, but that’s not to say it’s not useful for smaller climbs and newbies. In fact, its size ensures its better constructed and more reliable than larger options, with robust buckles for solid storage, while the robust nylon cover is not something you always find in low-cost crash mats. You’ll also love the sleek, trimmed down design, which makes it easy to carry despite it weighing similar to larger models. This extra weight only ensures a more comfortable landing though, and it still doesn’t feel so bulky you think you’re not getting great value for money. However, because it’s meant more for maximizing your current crash pad space and is compatible with larger Asana products, it’s not advised to use it as a solo mat, at least not from too high up. This is a shame really, as it’s still a quality mat that’s highly reliable, and at least it’s cheaper than buying a brand new mat to add on, anyway. As much as we’d love to have tested these bouldering crash pads out ourselves we realized upon arriving at the rock we’re terrified of heights. Luckily, we had other options to help us determine which 8 products are the best ones to choose from. Reviews - Considering we’ve read reviews by those who have used their crash mats and lived to tell the tale, we can assume the options we’ve selected are pretty good. But it’s about more than this, and these reviews give us information about softness, durability, ease of carrying, and storage, and how they feel when you fall from a little too high up. Price - A rock climbing crash pad isn’t the cheapest thing you’ll ever buy, but when it comes to a decision between breaking your ankles or paying money to ensure you land softly, we’re sure you’d take spending the money every time. We looked for a range of prices affordable for beginners looking for a reliable crash mat to help build their confidence and experienced climbers who want a safe and reliable option for those higher climbs. Before making your final decision on which is the best bouldering crash pad for you, think about your needs as a climber including your skill level and climbing style to ensure you find one that properly suits your needs. Thickness - A thick crash pad is great for those who engage in a lot of traverse climbing, but this can affect how easy it is to fold and store. Hinge and burrito mats are easier to fold, especially when the mat is thick. Foam Density - The foam density of crash pads helps protect you when you fall. While a soft pad is more comfortable to sit and relax on, it won’t be as beneficial when dropping onto it, but one that’s too hard can cause injury, especially if you like to land on your feet. Finding the right density balance is essential, as it can mean the difference between falling in love with bouldering and never doing it again. 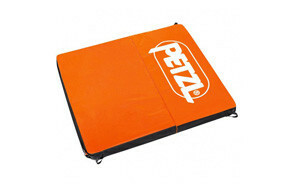 Size - Your crash pad for climbing should be large enough to give you adequate protection following your drop. But the size isn’t just relevant for when you land. A mat that’s too large will be more difficult to store and carry, so ensure you find the proper size to fit in your car. If possible, you can invest in a mat that allows you to connect to other mats to increase your surface area. Durability - Dragging your crash mat between crags and over uneven, often jagged terrain has the potential to destroy the mat cover. Ideally, you want to find a cover material that’s 900 denier or above so it can withstand hazardous terrains. Ease Of Use - You may not think crash mats are too difficult to use, but features such as weight and the closing mechanism can cause unnecessary stress. If it’s too heavy to carry on your own, you can forget about climbing for the day when by yourself. There are also aspects such as gear pockets, shoulder, waist, and chest straps, and shoe mats to wipe away dirt and rock debris. Anything that makes your mat easier to use from start to finish is always preferred. There are several styles of folding bouldering crash pads to give you a suitable solution to fit in your car and make it easy to carry once you get to the bouldering site. Hinge - A hinge-style bouldering pad has a piece of foam cut in half and connected from a thin piece of material. It folds flat and requires little effort to ensure it remains closed. 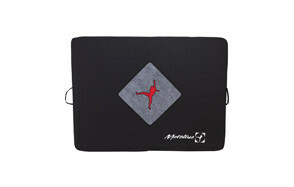 Some hinge-style mats also come with a zipper to keep it secure and easier to both store and carry. Because it folds flat, you can also use it as a sofa or even somewhere to sleep, which delivers greater value for money, especially if you’re a traveling climber who doesn’t want to splash out on a hotel room. Unfortunately, the hinged style creates weak points (or dead zones) which could cause injury on jagged terrains. Taco - With a taco-style are single pieces of foam which you fold in half when not using them. Because there are no hinges, they aren’t as easy to fold and may require you to use your own weight to attach the ends to one another to reduce the size. However, there are no dead zones, which makes the whole pad safe to land on wherever including terrains with jagged rocks. This style offers you the best protection against injury, but if you store it for a long time, it takes a while to return to its natural state after unfolding it. 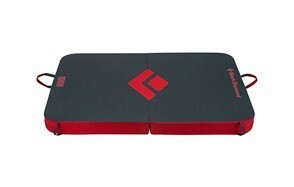 Burrito - The burrito-style bouldering pad folds much like the hinge but has more folds (like a burrito does). It boasts the same advantages of a hinge pad but also the same disadvantages. They are often larger, which can make them more difficult to store and carry, but this also provides a greater surface area to land on.